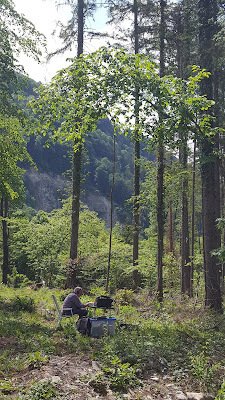 Last weekend we were active from seven different nature reserves in HB0 on five bands - SSB and CW. Propagation was poor on the higher bands but the weather was much better than the forecasts. 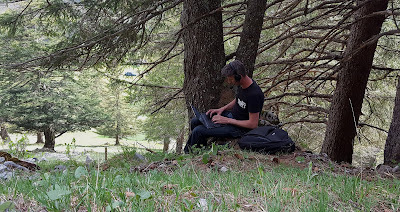 We logged almost 1700 QSOs and 55 DXCC (67 DX contacts, ODX = 10,000 km into PY5). Our award program resulted in 15 gold, 53 silver and 140 bronze awards for the almost 1100 different callsigns in our log. We arrived on Friday after a day driving through PA, DL and OE. Our first surprise was a couple of HB0 QSL cards in the reception area of the hotel. It turned out they were familiar with radio amateurs and had no problems whatsoever with us putting up antennas. As we planned to do some digital activity from the hotel we were pleased with this attitude towards ham radio. However once we set up our radio station we found that there was a source of QRM in the hotel that caused signals up to 9+10dB on all bands. We were unable to locate the source, so we only made a handful of FT8 contacts. We later learned a lot of people had heard us, but we were just unable to copy them. Our guest operator Augusto HB9TZA/I2JJR arrived later in the evening and together we went up the hill behind the hotel to do a first activity. 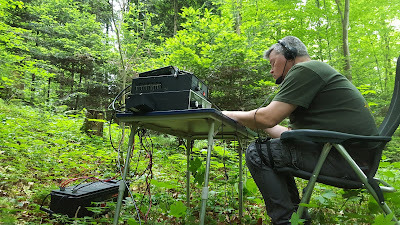 We used HB0/PH0NO and HB0/HB9TA on 40m logging quite a few JA's with good signals. We had breakfast as early as we could get it and headed off to the first park we selected during our planning. On the map it looked like we could enter the park by car but a sign told us not to do so. We decided to take a small risk by bringing all our gear into the park and then return the car. There was no path inside the reserve, so we had to build up our station in the bushes. 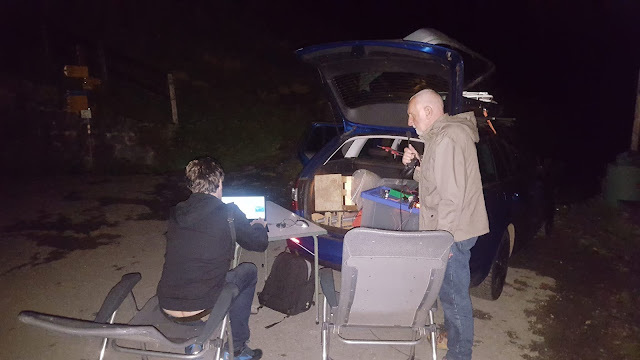 We even managed to get the hexbeam up but it took far too much time and with the poor propagation on 20m and up, we only got a handful of contacts with it. We moved on to the next park (HBFF-0127) grabbing some sandwiches on the way. 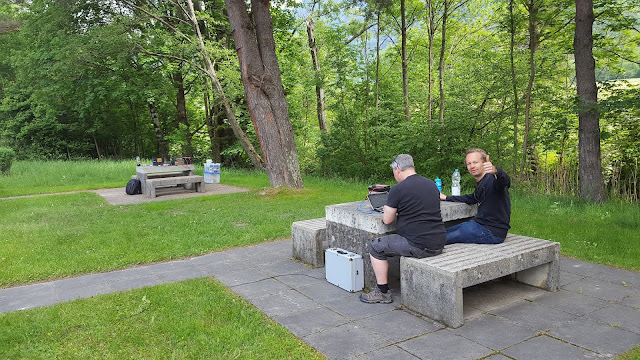 The next location featured a picknick area with two picknick tables. This was an ideal location for running two stations. We set up a station on 20m and on 40m (CW and SSB) using end fed wires and band filters. Again 20m was very slow. We did not have the sporadic E conditions that really helped us the previous year during our expedition to LX. 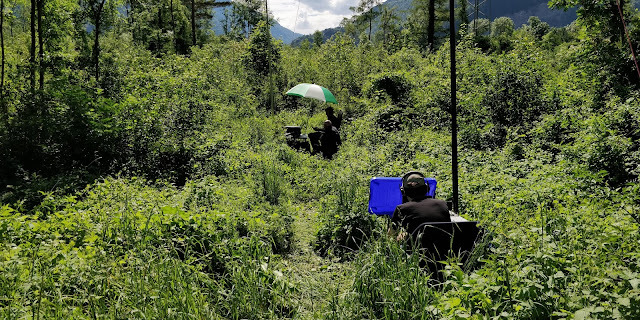 We moved on to a location on the side of a mountain, next to a high radio tower (HBFF-0123). 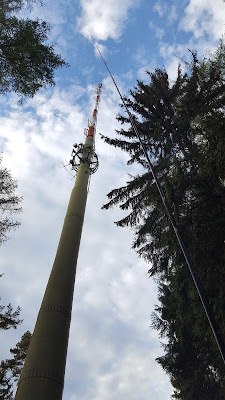 We were curious whether this tower would cause any interference but luckily it did not. We were active on 20, 30, 40 and 60m in CW and SSB. Again 40m was the best band with most activity although 20m did pick up thanks to Es (100+ QSO on 20m). It was time to get something to eat but we were eager to activate one more park. So we settled for a quick pizza and moved higher up into the mountains. We found a nice place in HBFF-0120 with a wide view and set up our stuff before it got dark. We stayed until midnight working on 40m and 80m. 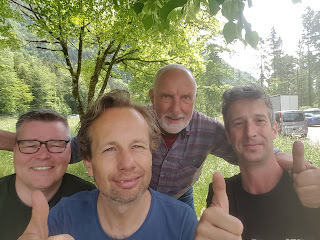 JA was probably behind the mountain this time as we did not hear a single JA station but we did log N2 and PY5 (odx with 10,000 km) on 40m in SSB. Sunday morning we got up early again but lost a lot of time finding a decent operating spot. Two of the planned locations were not accessible by a large distance - too far for us to carry all our stuff. We ended up in HBFF-0060 - a small walk from a car park. By the time we started it was 9 UTC - one hour later than on Saturday. Conditions on 20m were clearly better than the previous day. We logged 262 calls on 20m and 40m almost equally divided over these two bands. Two JA stations and one K3 made the trip. We had a quick snack and then it was time to say goodbye to our new friend and guest operator Augusto HB9TZA. We moved on aiming at one more park as rain was moving in. We had to drive around to find an access route but managed to get into HBFF-0121 on a hill but in the woods. Conditions on 20m deteriorated. We logged 255 calls in total but only 75 on 20m. There were some raindrops but using a tarp we stayed dry and by the end of the activity the weather had improved. With the weather looking okay we decided we could do one more activity after dinner. We did not have any candidates left in our initial planning but looking at the map we found two candidates near our hotel. That would allow us to have dinner there and to stay out late. We checked both parks to find only one accessible - be it by a very steep climb. 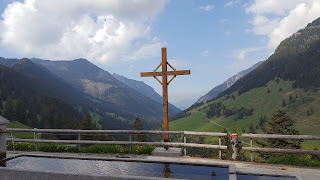 We decided to go for it and after a couple of climbs up and down the mountain we had all our stuff ready for operation. Looking back it was a great decision to go for this last park. Conditions on 20m were poor but 40m was incredible. We have all worked many pile-ups before but this one was the busiest and longest one of them all. 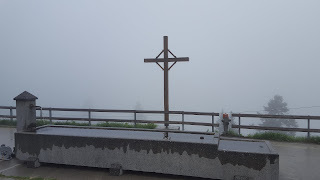 Actually, by the time we had to go (fog had come in and we slowly got cold and wet even wearing our rain jackets) there were still people calling. Staying on 20m on the second radio all the time allowed some of the NA chasers to get us in the log as well. We got as far out as west coast US (CA). When we left the next morning it was foggy, cold and very different from when we arrived. In the mean time our logs are online at WWFF Logsearch (thanks to HBFF), Clublog, LotW and eQSL. Our paper cards are in print and will be sent out as soon as we have them. [UPDATE: all cards have been sent direct or via bureau]. Special awards have been generated and can be downloaded here. It has been a great adventure with a great team. Usually stuff breaks but we got home with almost no incidents (apart from various car related issues of HB9TZA but that is a different story altogether). Thanks all for giving us a shout! We hope to meet you all next year for another episode of "YNOMY on expedition".